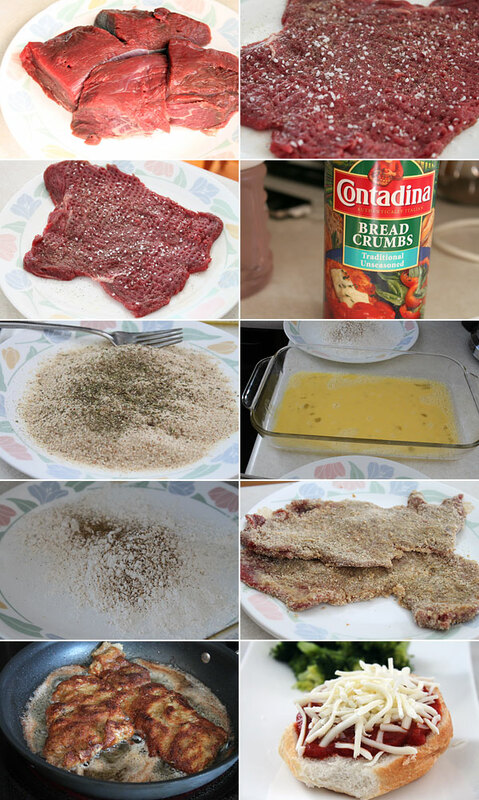 I’m not certain of the history of the breaded Sicilian steak, but I only know that I ate it when growing up. It reminds me a lot of a schnitzel, and it is essentially that; a piece of tenderized meat that gets breaded and fried. 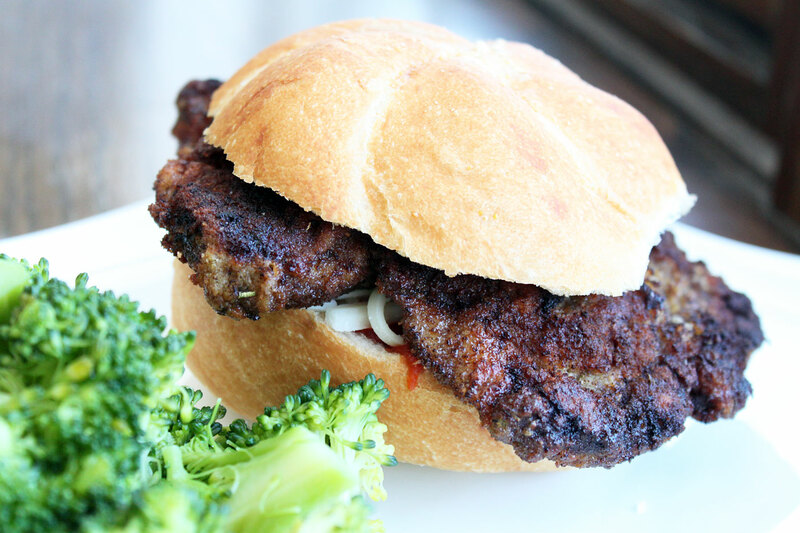 I’ve never made Sicilian steak for my family, and as I often see them stacked up, already prepared, at the butcher, I decided it was time to make my own, and make sandwiches out of them. Let’s just say my wife and kids loved them. Start by getting a couple of sheets of plastic wrap out. Lay one of the tenderloin rounds on top, then place the other sheet of plastic wrap on top. Using the flat side of a meat mallet, begin pound the beef, until you get it to about a 1/2 inch thick, or down to a quarter inch, being careful not to tear through the beef. Flip your meat mallet over and use the other side to tenderize it even more. Season one side with salt and pepper. Repeat with remaining beef. Next get your dredging station ready. To one container, add the beaten eggs and water. Mix. To another container, add the flour and season with some salt and pepper. To another container, add the breadcrumbs and Italian seasoning. Mix. Get a large, non-stick skillet heated on the stove on medium heat. Add your cooking oil, and let it come up to temperature, but not smoking. Add a flattened steak to the flour, and lightly coat each side. Shake off any excess flour. Next move that to the egg wash, and coat both sides. Move that into the bread crumbs and once turned, gently press down on each side to get a good coating. Cook one at a time in the oil, to get a golden brown. Once cooked, remove and let any excess oil drain on a paper lined plate. When you are ready, take the bottom portion of your roll and slather on the heated marinara sauce, then top with the mozzarella cheese, then the cooked Sicilian beef. Add the top bun, press down a bit, and dig in. This is a monster of a sandwich, and can be sliced in half and shared if you desire. My oldest pounded it down, and my middle man almost finished. I devoured it, and could not put it down, while my wife tackled half of it. This sandwich had that great crunchy texture, while being super tender, and when you get that great marinara and saltiness from the cheese, well let just say it was a great bit. Hope you enjoy. Using the flat side of a meat mallet, begin pound the beef, until you get it to about a ½ inch thick, or down to a quarter inch, being careful not to tear through the beef. Flip your meat mallet over and use the other side to tenderize it even more. Season one side with salt and pepper. Repeat with remaining beef.